One of my earliest posts — an article I wrote prior to launching Braveskimom.com in 2010. As you can see, there are too many words and not enough photos. But the sentiment is sincere! And Snowbird continues to offer up “practically perfect days”! Salt Lake City, March 11, 2009. It has been bombing snow for over twelve hours. Little Cottonwood Canyon is closed until 9:00 a.m. We’re in our car. The traffic is slow. We stop. We go. It seems as if every skier in the Salt Lake Valley is headed up Little Cottonwood Canyon, but we don’t care. We know what they know. This is the first really good powder day in a month and since we’re in Utah, we know that what Utahns call “crowded” isn’t what the rest of the world calls “crowded”. We park at the back of the Creekside Parking Lot and have to walk for a total of (maybe) three minutes to the Gadzoom High Speed Quad. There is no charge for parking, no line for the bathroom, no line for coffee and no line at the lift. The snow is incredible. The locals are complaining about the crowds. This is Snowbird. We haven’t been here in 15 years and when we tell a Ski Patroller on the tram this fact he looks at us wryly and says “What? You have a bad day?” We can’t believe we haven’t been here for so long either. Our kids are awestruck by the terrain. We find untouched powder in the trees off of the Gad 2 Lift. We pass through a cloud to the top of the (aptly named) Little Cloud Lift and they can’t get over the lack of trees up high and all the off-piste skiing in the Cirque and along Regulator Johnson. We take these slow lifts several times and the skiing is so good that who cares if it is slow. There are no lines. We take the Peruvian Express Quad up to the tunnel connecting Peruvian Gulch and Mineral Basin and when we open up into the Basin we see that the Bookends Traverse has just opened. This is heaven. This is Nirvana. It’s now 2:00 p.m., it’s sunny and acres of fresh are ready for the picking. The Bookends lie beyond a pristine bowl where anyone willing to hike just a bit can make his or her mark on the mountain. 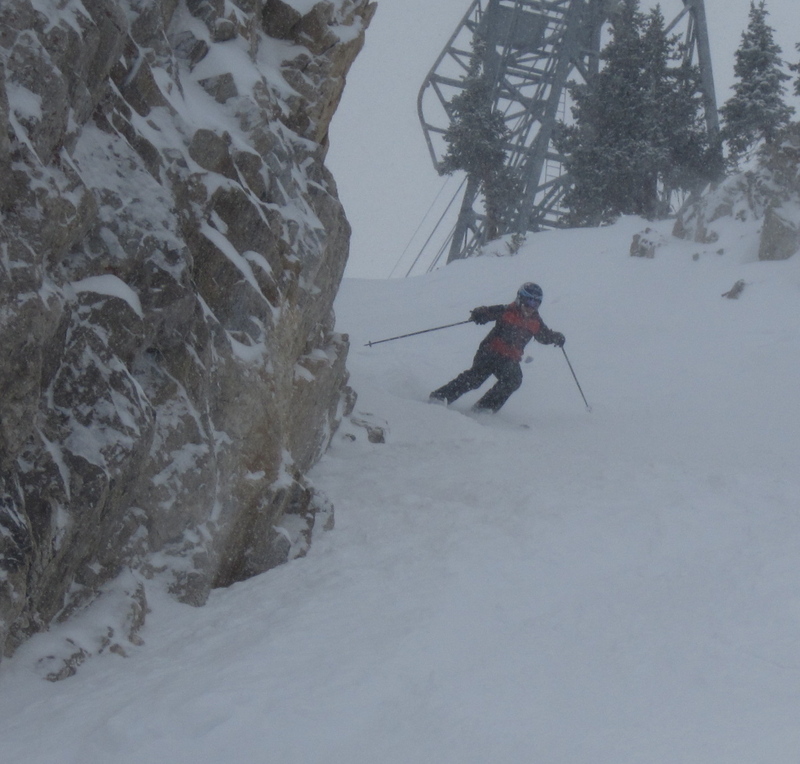 We race to the Bookends and ski it – our youngest son literally whooping it up as he reaches the bottom. As he looks back at his trail of nearly perfect “S’s” he smiles broadly and tells me that he just had the most fun he has ever had. We jump back on the Mineral Basin Express Quad and as we approach the top we notice the Ski Patrol closing the gates for afternoon sweep. The Bookends gate is still open so we race past a patroller and duck through. He closes the gate behind us. Can it get any better than this? We come up again two days later and this time there is hardly anyone at Snowbird. It’s a Friday, the sun is shining and the western-exposures are bulletproof from melting and remelting the day before. We start out skiing some fast groomers and then take the tunnel (yes, tunnel – with a magic carpet to move you along) to Mineral Basin. The Bookends is thoroughly tracked, but the snow stays mainly in the shade and it’s soft. A couple of runs are enough however, so we make our way back to the Cirque, which, by now, is perfect: steep pitches, moderate, soft moguls and to skier’s left, the World Freestyle Championships. Skiing adjacent to the pros, we let our imaginations wander and become the heroes of our own lives. Our son in a chute, and lots of pow, off of the Cirque, Snowbird. I’m sure it’s possible to have a bad day at Snowbird. I just never have. Compared to the larger resorts in my home state of Colorado, Snowbird is very relaxed. While we were chatting up a Ski Patroller on the tram, we learned that on a crowded day, Snowbird gets around 7,000 skiers. There are 2,500 skiable acres at Snowbird. For comparison sake, Vail is over twice as big, but gets about three to four times as many skiers on a busy day. I am not criticizing Vail here. They do a great job moving people around and providing great skiing. It is just that Snowbird delivers a big-mountain experience with a small-mountain feel. Snowboards at welcome at Snowbird, although they are definitely in the minority. Afternoons bring University of Utah students by the droves and you can feel the increase in adrenalin and pace as they hit the slopes, but they stick to the extreme terrain, so beginners and intermediate skiers will never feel threatened or pushed aside. There are intermediate runs off of each Express Quad and the tram, with the Baby Thunder lift dedicated to beginner and family skiing. There is no town or village to speak of, just the resort amenities and some resort-owned lodging. Architectural charm is not Snowbird’s strong suit, nor is après-ski, fine dining, shopping or night life. Snowbird is a skier/boarder’s mountain. Bring your family here if they are serious about skiing, laughing and enjoying one another’s company. Everyone will be challenged and everyone will be tired at the end of the day. Best of all, everyone will be smiling, having had, possibly, a practically perfect day. Lodging can be booked at the resort through the resort website. There are some private homes and cabins available to rent in Little Cottonwood Canyon. Vacation Rental By Owner (VRBO) is probably your best resource. Downtown Salt Lake City is only 45 minutes away and offers many lodging options. Our favorite is the Little America, with huge, clean rooms and an indoor/outdoor pool. Breakfast is not included. In the suburbs close to Little Cottonwood Canyon, we have stayed at the Crystal Inn Midvalley, which not only includes a hot breakfast, but also a hot dinner (for example, lasagna or hamburgers) in the cost of the room and has an indoor pool. The Salt Lake City Visitor and Convention Bureau is an excellent resource. 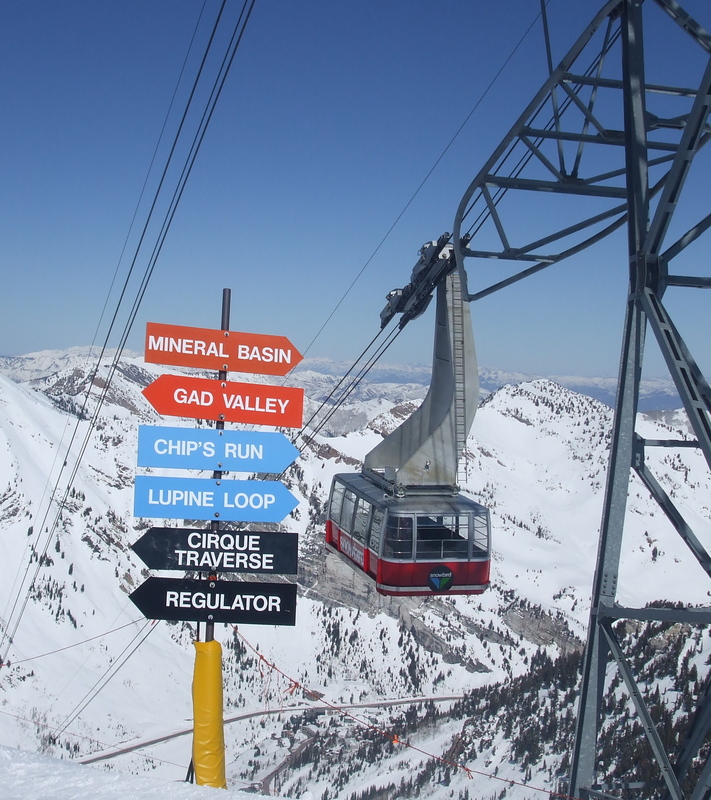 The VCB sells the Salt Lake Super Pass which provides access to Snowbird, Alta, Solitude and Brighton. If you book before December 15 and stay four or more nights, your 4th day of skiing on the Super Pass is free. Discounted Snowbird tickets are also available in Salt Lake and the surrounding suburbs at Canyon Sports and Ski ‘n’ See. Finally, my one and only real complaint about Snowbird is that as you ski you will see ads for incredible après ski deals at the Snowbird lodges. Our youngest son loves wings and couldn’t resist the idea of $.33 wings. We decided to indulge him (at that price who wouldn’t? ), only to find that après ski specials are available only in the area “lounges” and that due to Utah’s funny liquor laws, minors are not allowed inside with their parents and there is no food service outside the lounges. Bummer. © 2010 – 2019, braveskimom. All rights reserved. Any use or publication of content, including photos, requires express permission.